Lots of questions still linger about e-cigarettes, including just what you’re breathing in when you vape. 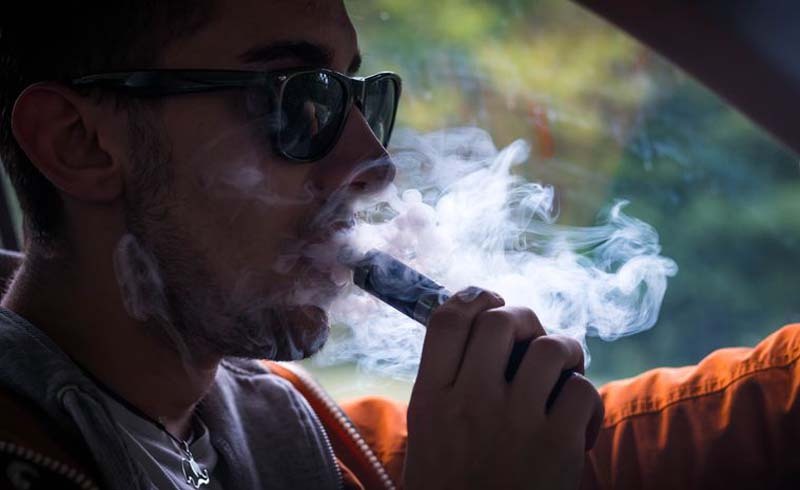 New study findings show that the vapors from a variety of devices contain potentially toxic levels of metals, including lead. The study comes on the heels of research out last year that detected metals in e-liquids used in the devices. Johns Hopkins Bloomberg School of Public Health researchers recruited 56 daily e-cigarette users and studied the vapors they give off. "We devised a relatively simple system that collects the aerosol, what people call the vapors. We collected it almost as soon as it came out of the e-cigarette,” study author Ana María Rule, PhD, MHS, told Men’s Health. A significant number of the devices emitted vapors with potentially unsafe levels of lead, chromium, manganese and/or nickel, says Rule, an assistant scientist in the Department of Environmental Health and Engineering at Johns Hopkins Bloomberg School of Public Health. “The EPA has national air quality standards. There’s a limit that the EPA has set based on health effects. Almost half of our samples exceeded that limit,” Rule says. “The EPA has national air quality standards ... Almost half of our samples exceeded that limit." E-cigarettes are battery-powered devices that use a metal coil to heat up liquid nicotine and convert it into a mist, or vapor, that users inhale. There are about 600 different kinds you can buy online and as many as 8,000 different types of liquids available. The Hopkins researchers also tested for the presence of metals in e-liquid refilling dispensers and in the remaining liquid in the e-cigarette tanks. "Knowing many metals are toxic when inhaled, we wanted to check it out," Rule says. "We didn’t know what we were going to find." The metals they discovered, when regularly inhaled, have been linked to lung, liver, immune, cardiovascular, and brain damage, and cancer. How Are the Metals Getting Into the Vapor? Some of the metals may enter the vapor through their contact with the metal coil, but that didn’t explain the presence of lead, because coils don’t contain lead. “There’s no reason for lead to be in there,” Rule says. It’s possible that metals are in the flavors that are added to some liquids, or that contamination comes from the materials used in the containers that hold the liquids, she speculates, but more research needs to be conducted in this area. “There’s no reason for lead to be in there." The small study, published online in Environmental Health Perspectives, brings home a couple of important points, says Michael Burke, Ed.D., program supervisor of the Mayo Clinic Nicotine Dependence Center. “You don’t know what you’re inhaling. It varies based upon the liquid, the heating element, and what you may be inhaling in the vapor,” Burke told Men’s Health. “What we really need," he says, "is an [FDA] process by which the liquids, the heating elements, and the vapors are standardized and put through testing to show that they’re safe." What Are the Health Effects of Using E-Cigarettes? Scientists will need decades of studies to fully explore the potential long-term health effects of vaping, but here’s what we know so far about what you’re risking when you e-smoke. You could feel dried out. Glycol and glyercol vapor, found in most e-cigs, are irritants that can dry out your mucous membranes (the skin-like linings on your eyelids, nostrils, mouth, and lips). The result? Lots of un-fun side effects: itchy eyes, a dry mouth, and throat, and a dry cough. 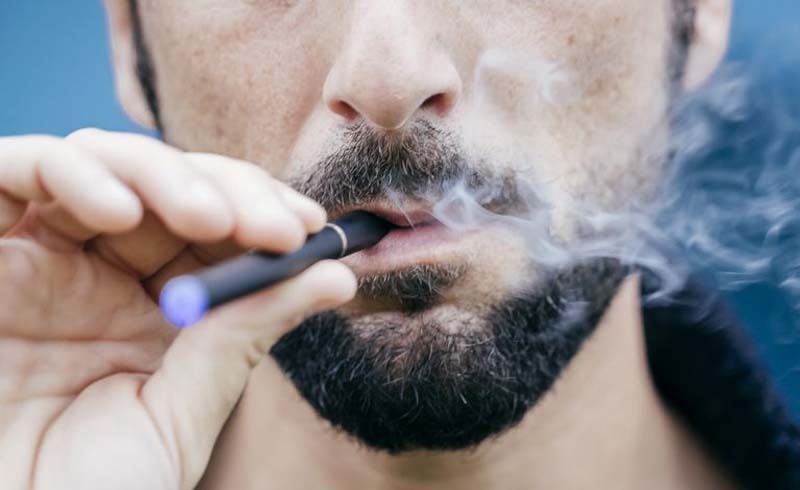 Although e-cigarette vapor does not contain as many harmful chemicals as cigarette smoke, which has a deadly mix of 7,000 chemicals, according to the Centers for Disease Control (CDC), most vapor still contains one key ingredient: highly-addictive nicotine. What does that mean? Yep, you can still get addicted—even if there’s less nicotine. And while some smokers are trying e-cigs in the hopes of weaning themselves off of cigarettes, results are mixed, with generally low rates of long-term success, according to a review of twelve studies and surveys. That could be why The Food and Drug Administration (FDA) hasn’t approved of e-cigs as a smoking cessation aid. You could feel dizzy or sick. Low doses of nicotine in e-cigarettes can cause the typical slew of symptoms that cigarette smokers experience — dizziness, abdominal pain, nausea, and vomiting, especially for first-time vapers, according to a review in the journal Circulation. You put your heart health at risk. Nicotine in e-cigs gets your heart beating faster, ups your blood pressure, and can harm your heart, according to a review by the American Heart Association. Over time, the ingredient can damage heart cells, too, potentially contributing to heart disease. You could increase your risk of developing cancer. It’s no surprise that cigarettes cause lung cancer, but e-cigs contain cancer-causing agents, too, including formaldehyde (a.k.a. that chemical that those preserved frogs you dissected in high school biology reeked of). The hotter the e-cig gets? The greater your exposure. But even relatively low-heat e-cigs expose vape users to harmful levels of formaldehyde. You could increase your risk of developing a serious lung disease. A common flavoring in e-cig vapor called diacetyl has been linked to severe respiratory impairment and an irreversible lung disease called “popcorn lung,” or bronchiolitis obliterans, when inhaled, according to the National Institute for Occupational Safety and Health (NIOSH). Even grosser? Ninety-two percent of e-cigs tested contained diacetyl, one study found. U.S. Daily News: Is Vaping Bad For You?